Only a small amount of abdominal fat. Make sure that your cat is otherwise healthy, and to discuss the best course of action. Consider switching to Tiki Cat® wet foods. High Protein – Tiki Cat® wet foods are rich in protein, offering more protein than many big name brands. The high-quality protein sources, like real, shredded chicken, chicken liver and flaked fish, give cats sustained energy and muscle mass, and satisfy their hunger longer. No Carbs – Cats are obligate carnivores and do not require carbohydrates as nutrients. Plus, carbs can lead to obesity when the energy they provide exceeds the cat’s energy needs, and the extra glucose is stored as fat. Tiki Cat® wet foods do not contain carbs and closely mimic cats’ natural prey diets. High Moisture – Many cats don’t drink enough water. Tiki Cat® wet foods offer high moisture levels to give cats the supplemental water they need to help hydrate their bodies and keep them feeling full for longer. If you prefer to feed dry consider a kibble that’s specially formulated for overweight cats. 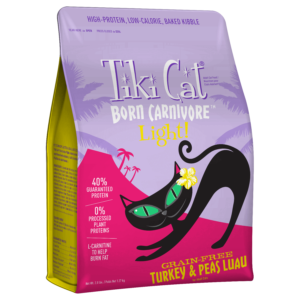 Tiki Cat® Born Carnivore™ Light has 18% fewer calories than Tiki Cat® Born Carnivore™, with real turkey as the first ingredient and lean protein source, and L-carnitine to help burn fat. Follow the feeding guidelines on the package. These guides are carefully determined by the nutrition experts who formulate the foods to give cats the ideal amount of daily calories, fat and nutrients. However, other factors can affect how much food your cat needs, such as their activity level, or if you mix wet and dry food together. Talk to your veterinarian if you’re unsure how much to feed your cat. Love to treat your cat? Luckily, you still can, as long as the treats are low in calories and you limit the amount you feed. Tiki Cat® Crunchers are deliciously meaty and less than 3 calories each – perfect for rewarding your cat without the guilt! Keep your cats active by playing with them regularly and leaving out stimulating toys for independent play. Cat towers and toys they can pounce, like toy mice, are perfect for these natural hunters and climbers. As you can see, helping your cat get healthier doesn’t mean depriving them. In fact, it can be fun and delicious for your cat, and easy for you! 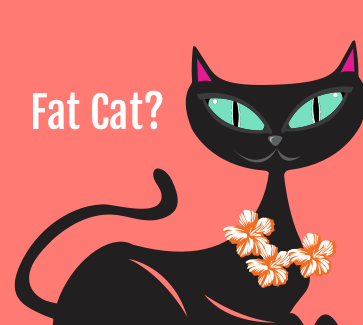 Good luck, and be sure to share your cat’s results with us on Facebook or Instagram #TikiPets.